The previous record for a work by a living artist was held by Jeff Koons' sculpture "Balloon Dog," which sold for $58.4 million in 2013. 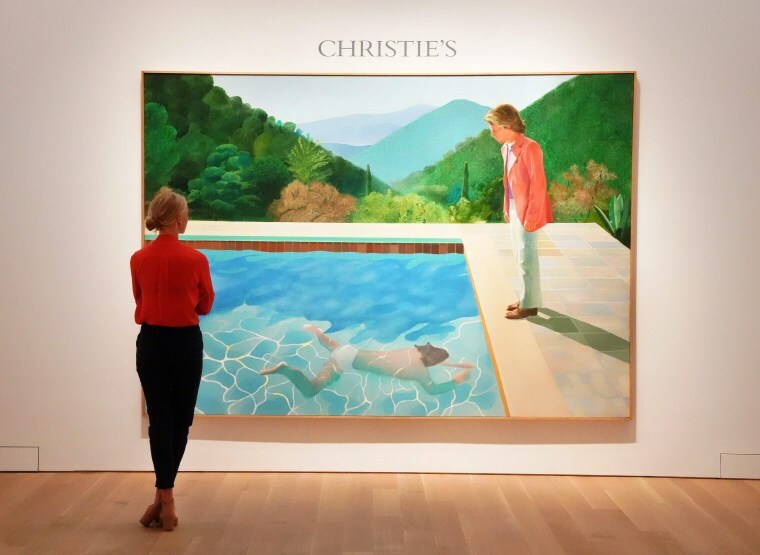 A 1972 painting by British artist David Hockney soared to $90.3 million at Christie's on Thursday, smashing the record for the highest price ever paid at auction for a work by a living artist. The previous record for a work by a living artist was held by Jeff Koons' sculpture "Balloon Dog," which sold for $58.4 million in 2013. Hockney's previous auction record was $28.4 million. Hockney's painting depicts a man in a pink jacket looking down on another figure swimming underwater in a pool. It was reported to have been consigned by British billionaire currency trader Joe Lewis. Christie's did not identify the seller or the successful bidder, who was bidding via telephone. Other highlights included Francis Bacon's "Study of Henrietta Moraes Laughing," which sold for $21.7 million against a pre-sale estimate of $14 million to $18 million, and Alexander Calder's "21 Feuilles Blanches," which more than doubled its high estimate, selling for just under $18 million.